In 1818 James L. Hubbard’s father, Amos Hubbard, co-publisher of the Norwich Courier, established a paper mill at the Norwich Falls on the Yantic River. The Hubbard enterprise ranked among the first in the state to use the modern Fourdrinier machine, a technical innovation that revolutionized papermaking by enabling mass production. James Hubbard (1832–90) and his son, Charles L. Hubbard (1855–1918), took over the family business, which would help make the younger Hubbard one of the wealthiest men in Norwich. In 1870 James and his wife Charlotte Learned Hubbard moved into this grande dame of Washington Street—a house set prominently on an elevated site for all to admire. 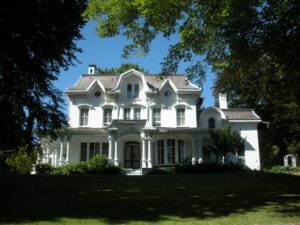 Charles and his wife Catherine Mather Hubbard also made this address home, with the help of three cooks, two chauffeurs, a doorman, and a live-in workman. By 1910, the household included four employees from Japan. The house’s mansard roof, floor-to-ceiling windows, and intricate woodcarving (foliate capitals, elaborate brackets, oversized beading) were the height of Victorian fashion—every detail exaggerated to impress. The twisted “rope” motif bordering the windows and doors was said to indicate a house-building project had been finished free and clear of debt. Like many of the larger residences in the area, this one has been divided into apartments.